None. Morning glory is a warm-season annual. Melon. Vigorous morning glory vines will twine up any type of support and grow into lush, heavy-blooming plants. They are at their best on a sturdy fence. Sow morning glory seeds indoors to get a head start, or you can plant the seeds where you want the plants to grow at about the time of your last spring frost. Morning glory vines are fast climbers that will run up fences, poles, or taller plants such as sunflowers. Morning glory flowers close up during the afternoon hours. Gather up the old vines after they are damaged by frost and compost them. Morning glories are related to tomatoes, sweet potatoes and other members of the nightshade family. 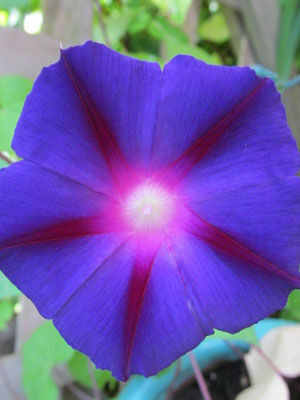 Many older strains of morning glory quickly become invasive weeds in warm summer climates. ‘Heavenly Blue’ and ‘Flying Saucers’ are safe choices because they set few seeds compared to many other varieties.